The Institute for Taiwanese Studies (ITS) is a Taiwanese American think tank established in the United States. The Institute's researchers, working on a voluntary basis, engage in studies related to Taiwan's past and future developments. Their research findings will be made public as research reports or commentaries. 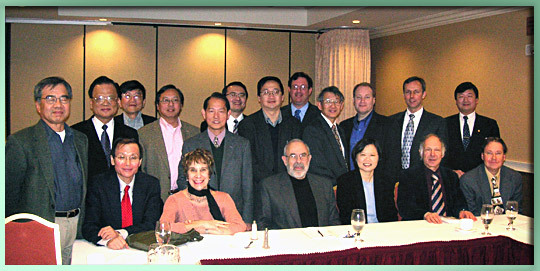 The Institute for Taiwanese Studies (ITS) hosted a roundtable, featuring Dr. Ing-Wen Tsai (third from right, front row) in Los Angeles on January 16, 2006. Currently, Dr. Tsai is the President of Taiwan and the Chairperson of Democratic Progressive Party (DPP, Taiwan). ITS Chairman Wencheng Lin (first from left. front row), ITS President Adolf Huang (standing behind Dr. Tsai) and the scholars from USC, UCLA, UCI, Rand Corp., ITS and other invited guests attended the session. ITS is exempt from federal income tax under section 501 (c) (3) of the Internal Revenue Code and also exempt from California income tax. ITS’ tax identification number is 74-3114703. For individual donation, please send a check to 19511 Rainbow Court, Cerritos, California 90703. Make check payable to ITS.